If you’re thinking about beekeeping, you’ve probably heard about Flow Hives. Heck, if you’re thinking about beekeeping, it’s probably because of Flow Hives! I can’t think another piece of modern beekeeping equipment that has captured the imaginations of potential beekeepers as this “honey-on-tap” contraption. But does it work? Is it worth the price? (Around $1000 Canadian*) Does it really make keeping bees easier? And, because we’re at BeecentricHive.com can it be used with other styles of hives to make them less expensive and more effective? Here’s my take. The first thing to understand about the Flow Hive is that it’s not a new type of hive. It’s a new way of extracting honey from a Langstroth hive. And it’s admittedly pretty slick. When the bees fill and cap the cells in the Flow Super the honey can be extracted by turning a key. When it works, you get clean, raw honey on tap! How cool is that?! That being said, it’s important to realize that the Flow Hive isn’t a Showtime Rotisserie (you can’t “Set It And Forget It”). Like all hives, the Flow Hive needs regular maintenance and inspections every 7 to 10 days. Why 7 to 10 days? Because the biology of a honeybee colony can allow them to produce a new queen and swarm in just over two weeks. This is honeybee behavior. There’s just no way around it. It doesn’t matter what style of hive you have, every 7 to 10 days you need to suit up, opening the hive, pull off the honey supers, finding the brood, and inspecting each frame. When it’s all said and done, keeping a Flow Hive is just as much work as keeping any other style of hive. The Flow Hive is a normal hive with “Flow Frames” located in a “Flow Super”. Unfortunately, these frames are made of plastic which honeybees don’t always except. If they decide not to use it, the bees will store honey in the brood chamber, run out of space, and swarm. One Edmonton Flow Hive user described Flow Hives as “swarm factories”. Of the three Edmonton Flow Hive users that I’m aware of, two of them have had some issues with the bees accepting the plastic Flow Frames. In contrast, I like the natural foundationless option. The bees prefer it. Given the choice between building on any type of foundation and building their own comb from scratch, I have always found the bees to prefer building their own. I can’t think of anything more tragic than excitedly turning the key on your Flow Hive then realizing that you’ve just extracted a box of brood. To prevent this, the makers of the Flow Hive recommend using a queen excluder to limit the queen to the brood boxes. Unfortunately, queen excluders aren’t 100% effective and can further contribute to swarming. You could probably get around using a queen excluder once the bees start storing honey in the top of the brood box. This would provide a natural honey barrier that the queen wouldn’t likely cross. Also, at least once source told me that queen doesn’t like laying eggs in the deeper Flow Frame cells. This could very well be the case. Whether to use a queen excluder or not is a controversial topic amongst beekeepers. Full disclosure, I’ve never used them. Bees don’t use them in nature so I’ve never cared to add them to my hives. I use Beecentric Hives that uses the same frames for honey and brood. So if by chance you had a frame of brood in your super and a frame of honey in your brood, they’re completely interchangeable. When it starts to get cold, the bees huddle together at the bottom of the hive. As winter progresses, they’ll consume honey upwards until they’ve reached the top of the hive by spring. At this point, the queen will start laying again. However, if this upper box is a Flow Super, the queen will start laying in the plastic Flow Frames. That would be a mess. As a result, the Flow Super would have to be removed in the fall. Not to mention, it’s hard to say how an Edmonton Flow Hive Super would hold up in sub-zero temperatures. It’s worth nothing that removing honey supers for winter isn’t out of the ordinary. It’s actually pretty standard beekeeping practice. Though, if you remove the Flow Super you’ll only be left with a single 8 frame deep brood box. The bees could potentially overwinter in one box but they’d be light on food. In our Edmonton climate, beekeepers typically overwinter in two 10 frame deep brood boxes. That’s an extra 12 deep frames of winter food. Let’s not forget that honeybees are storing honey to consume during the Winter and that the flow hive was invented in Australia. How much honey a colony needs to survive the winter depends on the climate. In Edmonton, most beekeepers prefer to have 80 to 90lbs of food going into the winter months. For comparison, I tend to overwinter the Beecentric Hive with three 8 frame medium boxes; two of which are filled with honey. That works out to around 90lbs of winter food for the bees. In the height of summer, hives in Edmonton can reach two or three brood boxes. In contrast, the Flow Hive comes with one brood box. To provide enough room and to prevent swarming, you’d need at least one (and likely two) more. You can be additional Flow Hive Supers but they’re around ~$70 Canadian*. It’s worth noting that the Beecentric Hive uses the same boxes and frames for honey and brood. This means they’re interchangeable. As a result, brood boxes can become honey supers and honey supers can become brood boxes. If the bees need more room for brood, I give them a box. If they need more room for honey, I give them the exact same box. It greatly simplifies things. Somewhat ironically, extracting from a Flow Hive isn’t as straightforward as it looks. For starters, it’s difficult to tell when the honey is ripe (capped by the bees) without opening the hive and pulling the Flow Frames out to take a look As the hive is advertised as being less disruptive, it’s kind of defeats the purpose. The danger of extracting uncapped honey is two-fold. One, uncapped honey has a high water content and will ferment on you. And two, instead of flowing out the back of the hive, uncapped honey will spill into the brood box below. This makes a lot of sticky and upset bees. How well the honey will flow from the back of the hive is dependent on its temperature. Though the bees do a decent job of maintaining a warm internal temperature, I have been told by some local Edmonton Flow Hive users that they’ve had the most success when the outside temperature is above 24 degrees celsius. It’s worth nothing that it takes about 20 to 25 minutes for the honey to drain from each flow frame. This means a lot of waiting. It also means that there’s a period of time in which the honey is exposed. This tends to attract wasps and other honey loving insects so it’s best to experiment with ways of covering/protecting the honey as it flows into your jars. Yes, the Flow Hive is pretty slick but I’m not all that convinced that it’s more convenient, easier, less disruptive, or less expensive than traditional extracting methods such a crush and strain or using an extractor. In either case, you’re going to have to check if the honey is capped and ready for extraction. Yes, there’s a window on the Flow Hive but it only gives you access to one-half of one frame. Since you’re probably pulling the frames out anyway (or crossing your fingers and hoping for the best) it’s not any harder to put them into a separate box and bring them inside for extracting. It takes a few minutes to spin out a frame of honey once its inside an extractor. Since you’re still doing regular hive inspections and pulling each frame out to see if the honey’s ripe for harvesting, the Flow Hive is no more or less disruptive than any other hive out there. Considering the $1000* price tag, I’m not convinced that it wouldn’t be cheaper to buy a “regular” hive and an extractor. I sell a Beecentric Hive with frames for $270 and I bought an extractor this year for $350. That’s saving ~$380. Now consider that until recently, I harvesting my honey and wax by crushing it for a cost of $0 (so now that’s a $728 savings). Also, consider that you can often rent extractors. If you’re in the Edmonton area, contact me and I’ll let you use mine for $20/day if you bring it back clean and in one piece. At ~$1000 Canadian*, the Flow Hive is far too expensive to buy everything outright. But here’s the rub; all you really need is a Flow Super (~$630 Canadian*) and some compatible 8 frame equipment such as the Beecentric Hive ($272). A Beecentric Hive with a single Flow Hive Super on top. Install package of bees or nuc into one box (Beecentric Hive). Perform regular inspections until the box is three-quarters full. Add a second box so that the brood can expand. Eventually, add the third box. Once the hive in three boxes high, you should start to notice some surplus honey being stored in the top-most box. At this point, add the Flow Super to the very top. Perform regular checks to make sure the bees have accepted the plastic foundation and are using it. Continue with regular inspections. When you see that the Flow Frames are filled with capped honey, extract directly into jars. Reset Flow Frames and repeat as often as needed. When the honey flow starts to slow down in mid-late August, remove the Flow Super. Let the bees start filling the remaining three boxes with honey. They will start storing honey at the top. Monitor progress. The goal is to let them fill two boxes with honey for the Winter. They should be able to do this by the time Winter hits but feed them if you think they’re going to run short. Wrap the four sides of the hive. Fill the top-quilt box with straw or mulch for insulation. Wish the bees well and start over in the Spring. 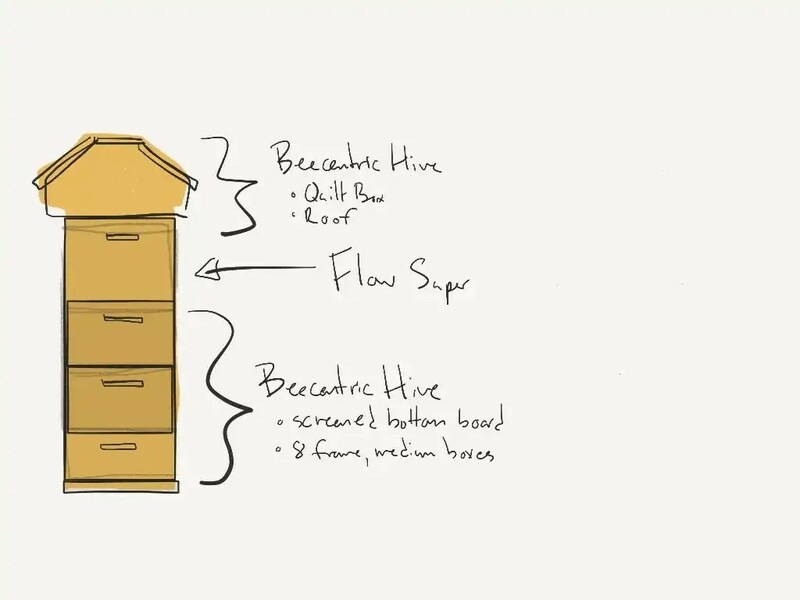 Click here, for more information on the Beecentric Hive or here from some of the most Frequently Asked Questions. *Prices converted from USD to Canadian Dollars on Nov 3, 2016. Flow Hive and Super prices do not take shipping or customs into account.